Realizing the immense potential and importance of solar energy, Ministry of New and Renewable Energy (MNRE), Government of India launched National Solar Mission (NSM) in 2010 to provide ﬁllip to the promotion of solar industry in the country. This initiative also aims at promoting ecologically sustainable growth to meet the global efforts to mitigate climate changes. The availability of high quality ground measured solar radiation data in the country till 2011 was unreliable and inadequate. Limited sources of data is compiled & published by India Meteorological Department (IMD) stations and satellite data. Non-availability of bankable and investor grade ground measured solar data was a major hurdle in the implementation of solar power projects in the country. To overcome these deficiencies, they launched a national program in 2010 for the establishment of a network of Solar Radiation Resource Assessment (SRRA) stations to collect solar radiation resource data covering GHI, DNI, DHI and associated meteorological parameters in a phased manner through National Institute of Wind Energy (NIWE), by establishing an exclusive SRRA unit. Under phase-I program of SRRA, 51 SRRA stations have been commissioned in 10 states and 1 UT and under phase-II sanctioned in 2013. Another 60 SRRA stations have been commissioned in 17 states and 3 UT cover the entire India. Besides the SRRA stations , 4 advanced measurement stations also have been commissioned under phase-II in the country to collect site specific attenuation of solar radiation due to various atmospheric constituents . 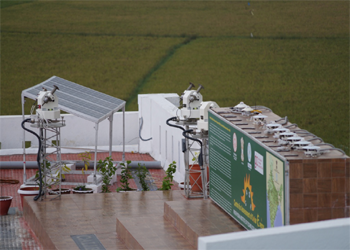 NIWE has thus established the world's largest solar radiation monitoring network, spread in 115 locations across India. High resolution 1 minute data from these 115 stations are received through GPRS technology in the server established in NIWE and a fully automatic quality control mechanism as per international standard is in force for data cleaning to make the data reliable. For the development of solar power plants, high quality ground measured solar radiation data is essential. A typical SRRA station consists of two towers of 1.5 m and 6 m tall. The 1.5 m tall tower is equipped with a solar tracker, one Pyrheliometer and two pyranometers (one with shading disc) to measure direct, global and diffuses irradiance respectively. The 6 m tall tower houses meteorological sensors for measuring ambient temperature, relative humidity, atmospheric pressure, wind speed & direction, rain fall and a state of-the-art data acquisition system. The solar sensors are traceable to World Radiation Centre/World Radiometric Reference (WRC/WRR) and the meteorological sensors are traceable to the World Meteorological Organization (WMO) respectively. The SRRA station is powered by solar energy for independent operation and has power autonomy for a week. A trigger switch is also part of the SRRA station to track the cleaning status of the station on a daily basis. One hundred and eleven (111) SRRA stations have been commissioned in the country in 29 States and 3 Union Territories (UT) during the period May 2011 to June 2014. The speciﬁcations of the sensors / instruments used in both the phases are identical, except for the inclusion of lightning arrestor and energy meter in the second phase of SRRA stations. Data collection sampling is 1 sec and basic data average is 1 minute. 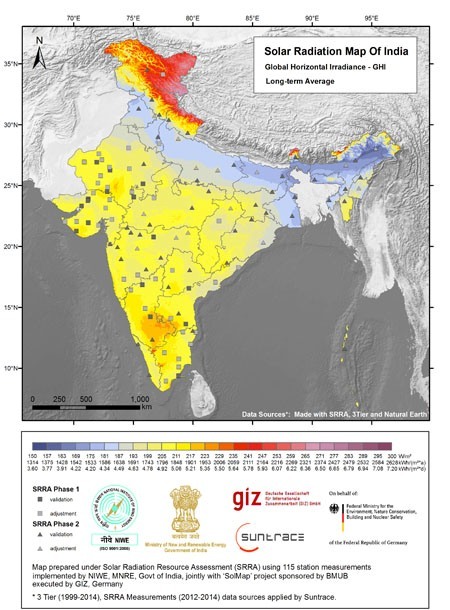 To quantify the site specific attenuation of solar radiation due to various atmospheric constituents, four AMS have been established in the country one each in North, East, South and West respectively at National Institute of Solar Energy (NISE),-Gurugram, Indian Institute of Engineering Science and Technology (IIEST)- Howrah, Prathyusha Engineering College (PEC)- Tiruvallur and Gujarat Energy Research and Management Institute (GERMI)- Gandhi Nagar (Gujarat). As the scattering and absorption etc.  are wavelength specific, ten independent narrow wavelength channels are used for the solar spectrum analysis. Each wavelength has an independent Collimator and Detector for simultaneous measurement of all wavelengths. AMS is also equipped to provide information on Aerosol Optical Depth (AOD) of the atmosphere, reﬂectivity of the earth's surface (Albedo), incoming long wave radiation (sky radiation) and atmospheric visibility for Research & Developmental purpose. 111 Solar Radiation Resource Assessment (SRRA) stations have been established in the country, one of the world’s such biggest measurement programme under MNRE scheme. 10 SRRA stations have been commissioned, 8 in Maharashtra and 2 in Kerala under SNA scheme. 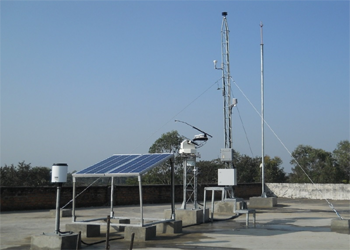 Four Advanced Measurement Stations (AMS) have been established in the country and these 4 stations are in the prestigious BSRN network, an arm of World Climate Research Program (WCRP) of WMO. India is the 2nd country in Asia after Japan with 4 such stations in this elite network. 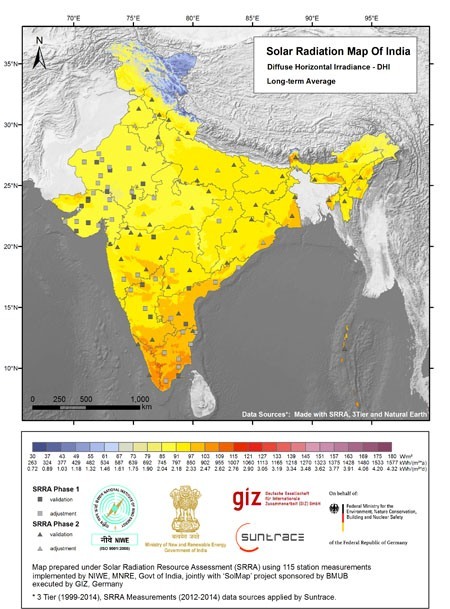 Based on the measured SRRA data from the field stations in conjunction with high resolution satellite data, the Indian Solar Radiation Atlas was developed. The atlas gives any solar stake holder, the solar resources at any point in the country along with annual energy production (AEP) from solar power plant for that location. 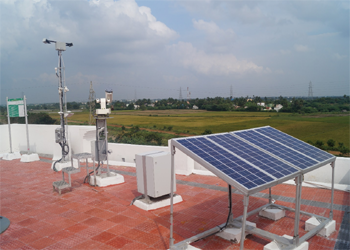 Established 3 calibration laboratories at par with International standard for solar sensors at NIWE-Chennai, PEC-Tiruvallur and NISE-Gurugram. Solar project feasibility studies carried out for M/s SJVN, New Delhi & ANERT Trivandrum. Due diligence studies for 50MW solar power plants have been carried out for M/s. ACME Limited & for 20MW SPV plant for M/s. MOIL Limited. Performance Guarantee Tests and Technical Audit for the 50 MW SPV plant is being carried out for NHPC, Faridabad. Establishment of 2MWp Solar Power Plant at IIM Trichy on turnkey basis. Customized training program on Solar Energy conducted for M/s. Suzlon Energy. Training program under ppp mode with 3 training firms (M/s. GSES India Sustainable Energy Private Limited, M/s Ultimate Energy Resource Pvt Limited & M/s Iacharya Silicon limited). Calibration on commercial mode completed for 83 Pyranometers and 3 Pyrheliometers. Quality controlled Solar Radiation Resource Assessment data from the field SRRA stations have been provided to 97 solar stake holders. Quality controlled field SRRA data have been uploaded in the NIWE website for the benefit of the solar stake holders. 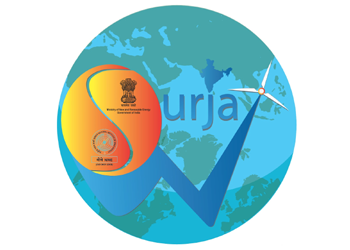 A mobile App known as SWURJA has been developed in android and IOS platform for the benefit of the solar stake holders to give the solar resources at any point in the country as well as the area calculation along with installable capacity, annual energy production for any technology. 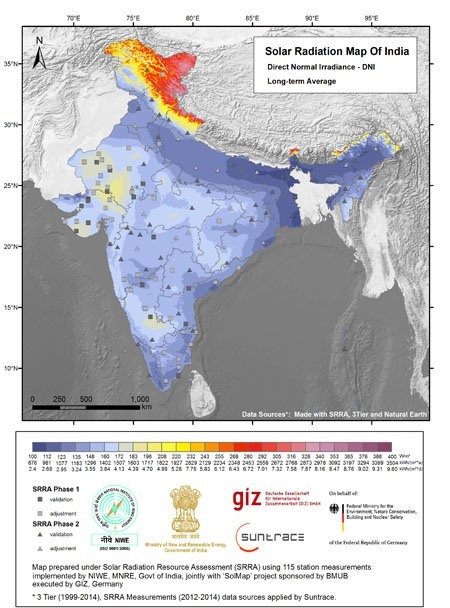 Development of an Indigenous solar power forecasting model for the country has been initiated with technical support of GIZ, New Delhi and an operational model is likely to come out by March 2019. A concept feasibility study on Virtual Power Plant (VPP) in India in association with GIZ GmbH, New Delhi, Fraunhofer IWES, Germany and ICF International has been initiated. Virtual Power Plant is a network of decentralized, medium-scale power generating units such as, wind farms, biomass and solar parks as well as flexible power consumers and batteries. The sources are often a cluster of distributed generation systems, and are often orchestrated by a central authority.